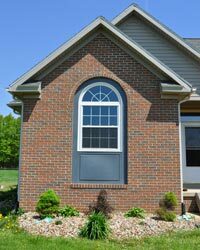 Pickerington Homeowners Take Window Installation off Your DIY List! No matter how large you might be living, chances are good you want to save money. Doing your own home improvements might even top the ways you're trying to bank a buck. In fact, the number of things you can do yourself continues to grow exponentially, as more and more HGTV and TLC programming becomes available. Window installation, however, shouldn't be on the DIY list for your home. As experts in the field of installing replacement windows, Universal Windows Direct has developed an exclusive line of vinyl windows called UniShield that you won't find at any home improvement store. In fact, you can only buy UniShield directly from UWD. And Universal Windows Direct has a team of window pros who not only know which new window style is the perfect fit for your home, they also know how to expertly install your new replacement windows, eliminating the headache of poor performance from a DIY job. The best part about installing new windows is that your vision can become a reality, without the headache of trying to bring it to life yourself. A no-pressure, in-home consultation can have you on your way, and financing is available to get you there even faster. Unlike box store windows, or even brands that rely on marketing hype to make the sale, UniShield windows are backed by a lifetime warranty, so you can be sure your home is cozy and energy efficient, 365 days a year. Did you know that a poor-quality exterior can downgrade the look of your home? If you're going to cut corners when upgrading your home's exterior, siding isn't the place to do it. Cheap siding can make even the most luxurious home look and feel undervalued - which is the exact opposite of what most homeowners are trying to achieve. Premium vinyl siding from Universal Windows Direct will make your home look more modern and even more expensive. This will help increase its property value and potentially help you sell your home faster if you plan to put it on the market. The difference between cheap vs. quality siding comes down to the engineering of the panels. Poor quality siding panels are often thin and flimsy, and they won't stand the test of time or protect your home against the elements. When you choose house siding replacement from Universal Windows Direct, you'll discover the true beauty and benefit of high quality siding. Our siding panels are levels above builder's grade and make your home stand out on the block. Available in panels of up to .46" thick, homeowners simply can't go wrong by choosing UWD’s siding for their new home exterior. 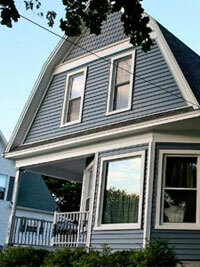 Keep in mind that UWD also offers an array of siding colors that are inspired by nature. From hues of beautiful blue to grey and green, you can get the exact look for your home to transform it into something that's entirely unique. What is the Key to Finding Beautiful and Quality Entry Doors in Pickerington? Your front door is a major focal point for your curb appeal. They are available in a variety of colors and materials, not to mention decorative glass options and even innovative security features. While you could simply go for a generic choice from a big box store, the good news is that you don't need to be boxed into bad door options that don't fit your style or personality preferences. Universal Windows Direct is the go-to source for front door replacement. Whether you're replacing a door that’s old and outdated or you simply need a quick yet noticeable aesthetic upgrades, homeowners turn to UWD for the best quality and value available today. How do You Know Which Entry Door is Right for You? A new door isn't an upgrade that you want to take lightly. Choosing the wrong material or style can essentially downgrade the appearance of your curb appeal. Narrowing down your decision is tough, but one great area to begin your focus is with material. 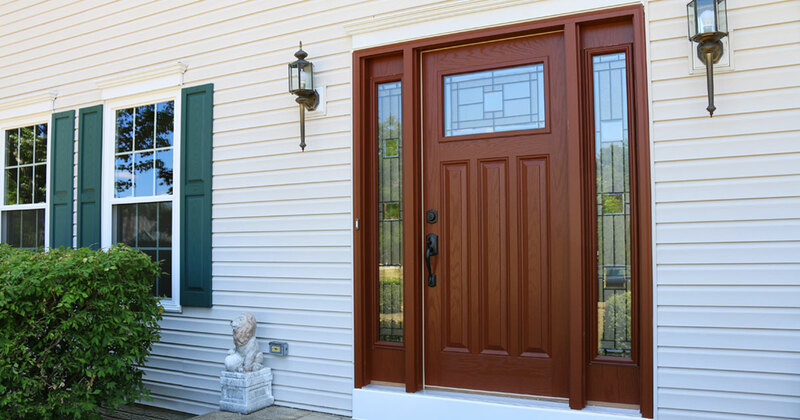 Fiberglass entry doors are a great option for homeowners who want the look of wood without breaking the bank. While wood is certainly beautiful, it's quite pricey and high maintenance. If you don't want to spend your weekends sanding your front door and applying a new coat of paint, fiberglass might be the right option for you. Even if you live in the safest neighborhood, you don't want to forget about security. Universal Windows Direct offers numerous entry door security features to give homeowners peace of mind. Choose from various deadbolts in finishes such as nickel and brass. We also have a touch screen deadbolt that allows for keyless entry at the touch of a few buttons. Find the best entry doors for your home from UWD today.